10 • December 2018 • S I G N & D I G I T A L G R A P H I C S Monthly News Roundup B Y T O N Y K I N D E L S P I R E D E C E M B E R 2 0 1 8 Get the latest industry news from Tony Kindelspire five days a week by signing up for our eNewsletter at sdgmag. com. Look for the red "Get the eNewsletter" button on the home page. Have industry news to submit? Contact Tony at tkindelspire@ nbm.com. Gerber Acquires Cutting System Company MCT Digital Tolland, Connecticut-based Gerber Technology, which makes products serving a variety of industries, including sign and graphics; manufacturing and industrial; government; aircraft interiors; and many oth- ers, announces its purchase of New Berlin, Wisconsin-based MCT Digital, a manufacturer of digital, grand- format flatbed cutting systems. According to Gerber, the addition of MCT's high-end large format cutting builds on Gerber's heritage in the sign and graphics and packaging industries, as well as giving it a key technology platform to serve its industrial markets. Gerber goes on to say that it and MCT are both recognized as pioneers in providing integrated software and hardware solutions. Gerber's been around 50 years, having invented automated cutting in 1968, and MCT has been around 30. 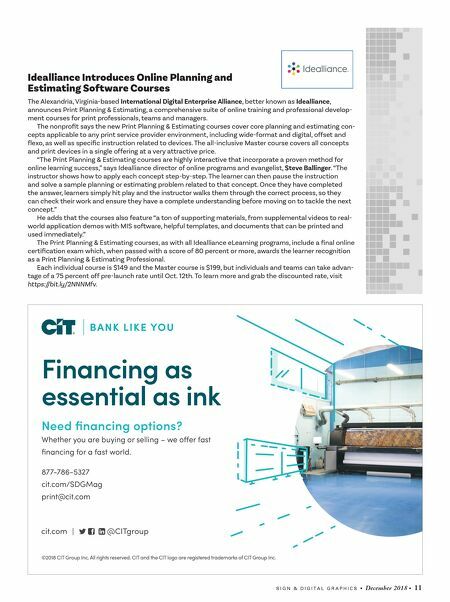 In 1999, through his company, Mikkelsen Graphic Engineering (MGE), Steen Mikkelsen launched i-cut vision for digital die cutting and in 2002, launched a version for print-to-cut workflows. In 2007, MGE was sold to Danaher's Esko division. In 2011, Steen's son Nik founded MCT and launched the CutGuru website for parts and consumables for finishing products. In 2016, they launched their first cutting systems along with their Tiger Vision print-to-cut software. Earlier this year MCT announced its relocation into a new 25,000-square-foot facility in New Berlin, Wisconsin, about 15 miles from its former home in downtown Milwaukee. 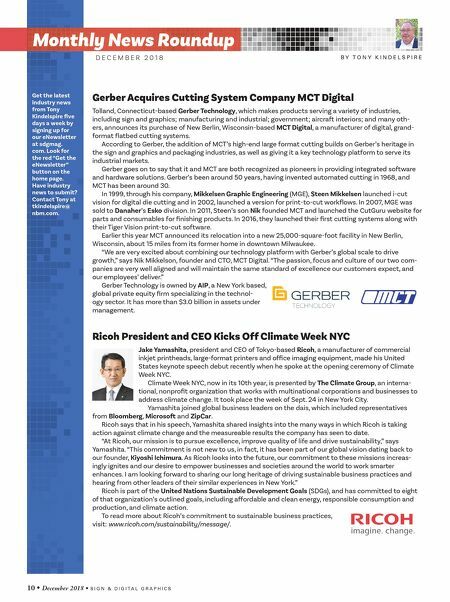 "We are very excited about combining our technology platform with Gerber's global scale to drive growth," says Nik Mikkelson, founder and CTO, MCT Digital. "The passion, focus and culture of our two com- panies are very well aligned and will maintain the same standard of excellence our customers expect, and our employees' deliver." Gerber Technology is owned by AIP, a New York based, global private equity firm specializing in the technol- ogy sector. It has more than $3.0 billion in assets under management. Ricoh President and CEO Kicks Off Climate Week NYC Jake Yamashita, president and CEO of Tokyo-based Ricoh, a manufacturer of commercial inkjet printheads, large-format printers and office imaging equipment, made his United States keynote speech debut recently when he spoke at the opening ceremony of Climate Week NYC. Climate Week NYC, now in its 10th year, is presented by The Climate Group, an interna- tional, nonprofit organization that works with multinational corporations and businesses to address climate change. It took place the week of Sept. 24 in New York City. Yamashita joined global business leaders on the dais, which included representatives from Bloomberg, Microsoft and ZipCar. Ricoh says that in his speech, Yamashita shared insights into the many ways in which Ricoh is taking action against climate change and the measureable results the company has seen to date. "At Ricoh, our mission is to pursue excellence, improve quality of life and drive sustainability," says Yamashita. "This commitment is not new to us, in fact, it has been part of our global vision dating back to our founder, Kiyoshi Ichimura. As Ricoh looks into the future, our commitment to these missions increas- ingly ignites and our desire to empower businesses and societies around the world to work smarter enhances. I am looking forward to sharing our long heritage of driving sustainable business practices and hearing from other leaders of their similar experiences in New York." Ricoh is part of the United Nations Sustainable Development Goals (SDGs), and has committed to eight of that organization's outlined goals, including affordable and clean energy, responsible consumption and production, and climate action. To read more about Ricoh's commitment to sustainable business practices, visit: www.ricoh.com/sustainability/message/.